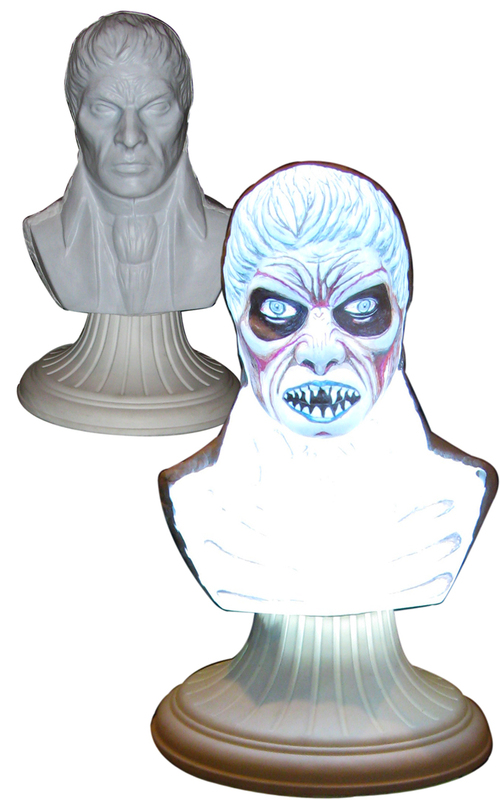 This unique special effect system appears to be simple, elegant, decorative bust that you might see in any museum, theme park event, Haunted House or Halloween Haunt. But then, unexpectedly, it reveals its true character in a flash. The bust will flash when triggered, momentarily showing an intense change of character, only to resume its normal state immediately afterwards. These incredible special effects items are specially designed to intermittently flash, taking them from a normal state to a shockingly frightening state. This effect can be operated using a steady, adjustable flash rate or using the built-in sound activation system, causing the effect to flash to sound effects, screams or music ("Thunder" works great in this application). This special effect system can also be synchronized with the Gallery of the Grotesque Flash Portrait. The Flashing Bust special effect is handmade and the flashing artwork can be customized to resemble specific character designs upon request. The special effects system shown here measures approximately 18 inches in height by 12 inches in diameter.